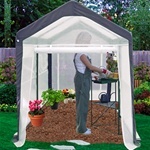 Plastic Greenhouses | Free Shipping and Handling! 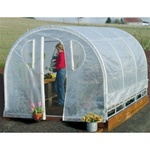 Plastic greenhouses are far superior to glass greenhouses because they are more durable. 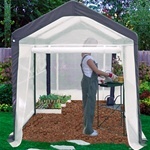 Our Snap & Grow plastic greenhouses feature polycarbonate panels that are virtually indestructible. 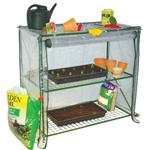 The Weatherguard and Early Start plastic greenhouses feature polyethylene covers. 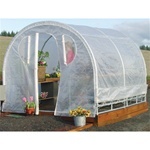 All plastic greenhouses shown here are offered with free shipping and handling! For more information about the polycarbonate panels used in our Snap & Grow kits, just click on any Snap & Grow product you see above and read the detailed information on the product page. Polycarbonate panels are far superior to glass for a number of reasons: they won't break or shatter like glass, they are much lighter weight, making the kit easier to install, and they are scratch and impact resistant. We use a high quality polycarbonate that is crystal clear, so to the observer, it will appear that your greenhouse is actually made of glass, even though it isn't. For more information about the Snap & Grow kits or any other product you see on our website, please call us toll free at 800-690-0132. We're available Monday through Friday from 7:00 am to 4:00 pm and we're happy to answer questions, take orders by phone, or check the status of an existing order for you. We look forward to talking to you!